Founded in 1970 in the Rocky Mountains of Western Montana, Capital Sports & Western has been a regional leader in sales of outdoor gear, clothing and footwear for four decades. Our mission has been to find the best quality and highest performance products available for the outdoor enthusiast and offer them at a fair price. We have accomplished this first and foremost through our sales force/buying staff who are passionate about where we live and the outdoor activities that we participate in. We spend as much time as possible recreating in some of the greatest places in North America. Try us for your outdoor gear needs and find out why so many Montanans like doing business with Capital Sports & Western. CrossCurrents—Montana’s Premier Fly Fishing & Orvis Stores. Fly Shop, Guide Service, Lodging, Boat Rentals, Fly Fishing Schools & Fishing Reports—The Friendly Fly Fishing Experts. 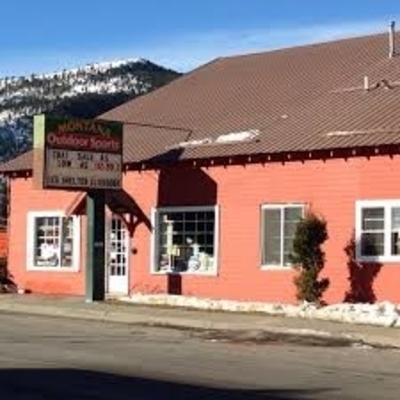 The Helena Store is located in the heart of Historic Downtown just one block East of Last Chance Gulch (“Main Street” in Helena) at 326 North Jackson Street between Lawrence Street and 6th Avenue. Our neighbors are the Montana Book & Toy Company to the North with US Bank to the South. We are the tallest building on the block and have a red clock tower on top of the roof. There is free parking on the street directly in front of the shop and two city parking lots immediately across the street that are only .50¢ per 1/2 hour (both lots are free after 5 pm and on weekends and holidays). Vehicles towing boats or RV’s can pull up and easily park in front of the shop provided there are no cars already parked in that location. Montana Outdoor Sports provides scuba equipment, instruction, and trips, as well as footwear, camping supplis, kayaks, canoes, rafts, firearms, X-C skis, fishing equipment, climbing equipment, U.S.G.S. maps, clothing, and rentals. The Base Camp is a Montana owned company since 1975 with folks that love to share the grand experience of Montana and the Northern Rockies. We love where we live, work, and play and we want to help you to enjoy our part of the country to the fullest. We have staff with the knowledge to direct you to all of Montana’s special places and what you will need to get the most out of your visit. Whether you want equipment for your next climb/hike or just comfortable and durable casual clothing to enjoy Montana’s lifestyle, The Base Camp has it all. Our lines of outdoor and lifestyle clothing include Patagonia, Marmot, Arc Teryx, The North Face & Prana. We will show you our favorites to keep you comfortable, warm and dry. We offer the best in footwear, casual offerings from Chaco, Teva, Dansko, Clark, and Keen, and rugged hiking footwear from Asolo, Scarpa, & Vasque. We are footwear specialists and guarantee your fit. To find your way around, The Base Camp has an extensive map and book selection. Our staff is also very knowledgeable on the surrounding areas and current conditions. We enjoy sharing local information that can help enhance your trip itinerary. We carry canoes, stand up paddle boards and recreational kayaks with all the accessories necessary for Montana’s lakes and river. In the winter, we have all your winter equipment needs including cross-country skis and snowshoes. Stop by the store and let us help you plan your stay in beautiful Helena, Montana!